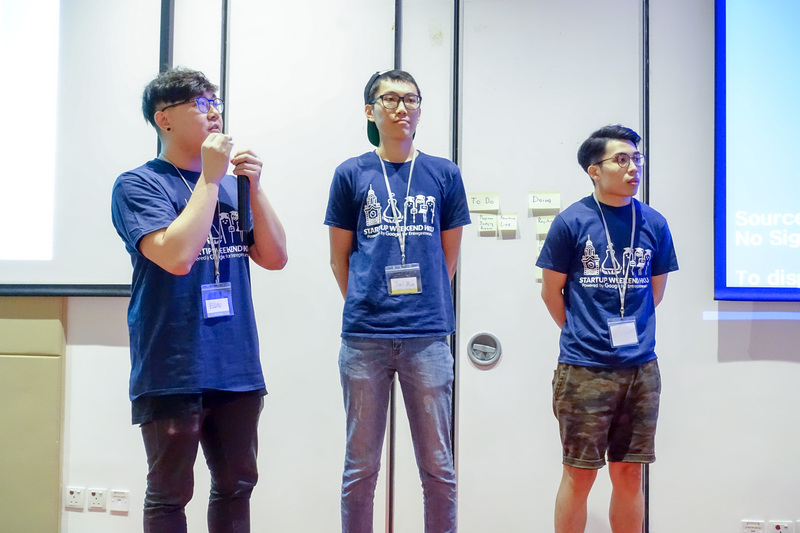 The third Startup Weekend HKU (SWHKU) concluded last Sunday and it was a day full of surprises. As teams lined up to pitch, reporters from TecHKU (who are also the organisers this time around) kept guessing what the products of companies such as Aftercrap or FaceAsk could be. 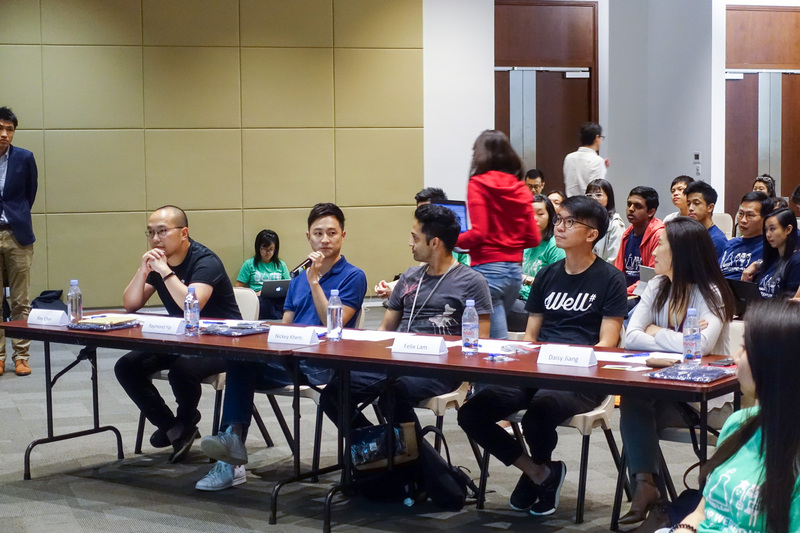 The #SWHKU3 judges (from left to right): Ray Chan, Raymond Yip, Nickey Khemchandani, Felix Lam, and Daisy Jiang. On Saturday, During the final judging, we could clearly see that this year, the ideas, presentations, and pitches were of remarkable quality. Over course of the weekend, 8 mentors, 3 pitch “doctors”, a workshop on UI/UX design for mobile apps and another one on landing page essentials. The participants had come up with amazing products in a very brief period of time. Managing to do market research, make demos, identify any issues, pivot their idea, and then go through the cycle all over again in the span of the weekend! Not to mention they also had to allocate time for consultation with 8 mentors, rehearsed their pitch with 3 pitch “doctors”, and attended 3 workshops specifically on the Business Model Canvas, UI/UX design for mobile apps, and landing page essentials! Although sometimes in such competitions, there are always clear winners and losers, this time at SWHKU it was impossible to shoot down even a single idea because they were all good! 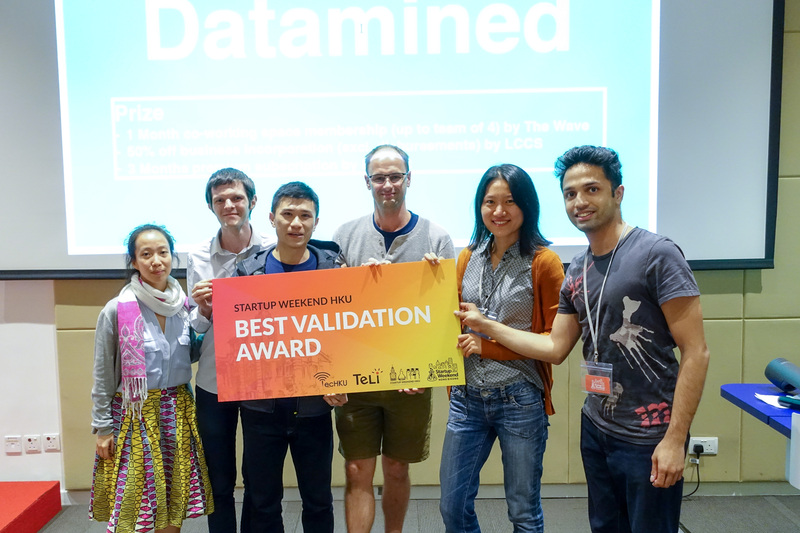 Judge Nickey Khemchandani presents DATAmined with the Best Validation Award at #SWHKU3. Some of the judges told us that evaluating the winners was a very hard task especially for the prize of The Best Validation. The award finally went to DATAmined, a team of academic researchers who came up with the idea of bridging the gap between researchers who require data that is lying waste with companies. DATAmined will be an online market place that would allow companies to sell their research data to academics in universities who are willing to buy it for their own research. The team spent a lot of time fine tuning their idea by speaking to researchers of HKU and also evaluating the market model to gain the best returns for itself. 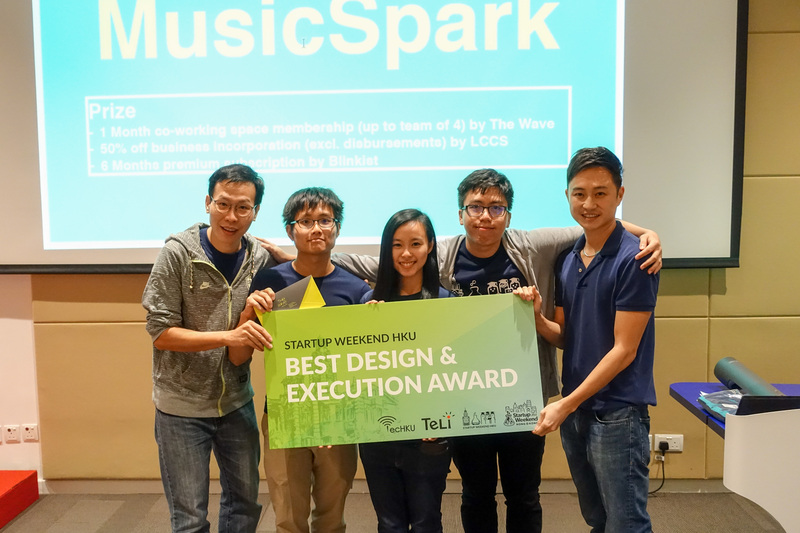 Judge Raymond Yip, whose team won the Best Design and Evaluation Award in the April 2013 edition of Startup Weekend HK, presents the same award to Team MusicSpark at #SWHKU3. The Best Design and Evaluation Award went to team MusicSpark who pitched a business venture to encourage high-school students to collaborate and learn music. Differentiating themselves from the competition, the team gave a live demo showing their prototype’s ability to convert voice into MIDI musical notes leaving the judges very impressed. Although I was personally skeptical about the MusicSpark’s idea, after talking to their team briefly, I realised that the application could have potential as a Slack for musicians. Judge Daisy Jiang presents the Best Business Model Award to Paperfox at #SWHKU3. Finally, it was Paperfox, a subscription management platform that bagged the biggest prize, The Best Business Model. 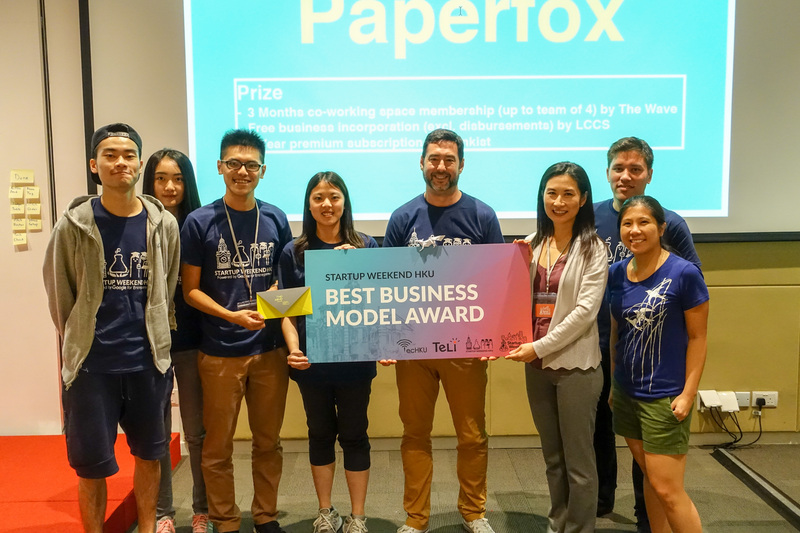 A company with the biggest team at SWHKU, Paperfox plans to help its customers reduce their expenditure on their unnecessary subscriptions such as gym memberships and Netflix while customers are away on vacations. The company had a very strong pitch and reassured the doubters in the audience that partner companies that live on the subscription model will like to sign-up for their apps since it promises the companies a chance to auto-renew subscriptions and eliminate the hassle of maintain their personal subscription renewal databases. Judge Daisy Jiang said Paperfox showed the most promise out of all the thirteen pitches that were presented to them at SWHKU. Team Weavle doing their final pitch on Sunday. However, there were several notable entries at SWHKU; an interesting one was Aftercrap, an app to register customer complaints of companies, small or large. They wanted to “meme-ify” the complaints by adding hilarious distortions and slogans to the complaint letters. Aftercrap plans to attract companies to their platform to address these complaints in exchange for a fee. Another interesting idea was MELT, a company to eliminate order-time and WAITERS from restaurants. MELT would provide its customers with the ability to place an order to a restaurant while they are on their way to it and provide a payment portal to settle bills. While applications such as Weavle promised its clients an event and location sharing app with a targeted advertising revenue model. We also saw two job-hunting / networking apps and two travel apps among the 13 ideas presented. The pitches also included other companies that offered services such as counselling to graduates, a marketplace for local goods, as well as an idea to make another object-tracking hardware (but with a difference). Overall, it was very satisfying to see that this year, all pitches were for ideas that were for the betterment of the society. The quality of ideas is only improving every year and I personally, cannot wait to see SWHKU next year!